Hoopty Rides: Will cars of today become classics tomorrow? Will cars of today become classics tomorrow? 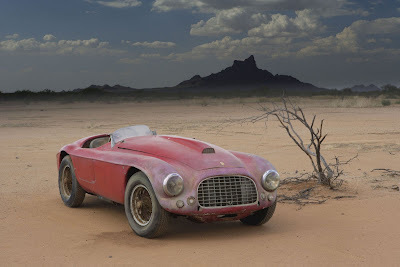 "Barn Find" 1950 Ferrari 166MM Touring Barchetta A lesson in savage grace. Today's Wall Street Journal has an article by Joseph White that asks if any of today's automobiles will become extraordinarily desirable Concourse cars of tomorrow. My opinion was not solicited. Luckily, with the power of the internets, I am free to weigh in without pesky journalistic standards. The discussion seems to have been prompted by the Pebble Beach debut of a barn find 1950 Ferrari 166MM Touring Barchetta, which makes comparisons quite difficult as any modern car will surely disappoint. "Will it be a classic? Of course!" "Like the 1950 Ferrari Barchetta?" "Well, no. Not like that. A classic, but in a much shittier form." Mr J: Of course, these big money, epic performers will always desirable. Will the Veyron be as undeniable as a bat wing Alfa or a Ferrari 250 Testarossa? I don't think so. WSJ: Corvette Z06, Pontiac Solstice, Chrylser 300C, Plymouth Prowler, convertible PT Cruiser, forthcoming Challenger, Cadillac CTS-V with the 5.7L, Buick GNX, Viper, Bullitt Mustangs. Mr J: Corvette Z06, absolutely. Relative rarity coupled with uncompromising performance, plus it's a Corvette. And enough will be parked into telephone poles that they will just get rarer. The Bullitt Mustangs are a good bet, but I think the top end Saleens would be even better. The sheer number of Dodge Viper posters on teenagers' walls assures the Viper a place in auto history. If you want to see the classics of today, visit the bedrooms of high school auto shop students. For sheer investment, I can't imagine a wiser automotive buy than a Viper GT-2 plexiglass window factory racer. The rest of them? Forget it. The convertible PT Cruiser? Come on. When the PT Cruiser first came out, zealous retirees would honk to signal that they too had an appreciation of old car styling. I was baking in my overheating hoopty as they beeped their horns from air-conditioned comfort. The absurdity of those moments continues to astound. Classics do not have to be as profound as a Cord coffin nosed art deco masterpiece, but they can't be lies either. The Prowler and PT Cruiser are deceitful. Mr J Additions: It is no Ferrari, but the Dodge Ram V-10 has brash appeal. WSJ: Original Audi TT, new Beetle and Mini Cooper S.
Mr J: The Mini Cooper S is a charmer and backs it up with performance. It is a rehash of a prior champion, but it is done so well. There were talks about building a lightweight boy racer limited edition and that would be enough to make a lasting impression. The Beetle and TT will be in design books along with Michael Graves teapots and Alessi cork screws, but they are too plentiful to enter the big leagues. They don't feel like enthusiast cars. Mr J: The 240z was such a dramatic shift from Japanese cars of the time that I think it has a good shot at becoming a classic. Mr J Additions: They missed the mark here big time. Add the Mitsubishi EVO, WRX-Sti, Skyline and Twin Turbo Supra, just to start. Like historic hot rods and muscle cars that were abused beyond recognition before being cut up for parts, there are some groundbreaking turbo CRXs and the like that should be stocked away in moth balls today. Can there be future classics? Jim Hall is quoted and addresses the issue of maintenance as it relates to computer electronics. That is a real concern, but I suspect if a car becomes a classic and the market incentive is there, somebody will be able to repair the computers without too much concern. He goes on to suggest there would be a market for a 'universal computer' that could be 'plug and play' to keep these aging cars running. Well, I agree there would be a market, but I have my doubts about the feasibility of a universal plug and play computer. Plus, auto manufacturers are now rolling out encrypted systems protected with a 64 bit key. If you can't open your car's computer, do you own it? A more damning issue is the sheer quantity of plastic in modern automobiles. Sure, my 1964 Chevelle wagon has plastic components but they are largely in a supporting role. In modern cars, plastic is elevated from trim and is sprinkled generously throughout the drive train. On my 1987 Mercedes 300 TD, these plastic components have become so porous and brittle that disassembly means breakage. Between the smog, under hood heat, and the corrosive petroleum products that power automobiles, all the plastic is coming apart at the same time. Epitomize Something New - Elegant roadster has been done. So has exotic wedge and brute muscle car. Quirky French car for peasants carrying wine and cheese has been covered. Find a new idea to get across. Not a new idea in cars but a new idea in the world - like teenage revolution in the 60's or proletariat Swedish safety. Longer Names - The Fiat Abarth Double Bubble Zagato Coupe. The Ferrari 250 GT California Spyder Long Wheel Base. If your babysitter had an idea for the hubcaps, mention her in the name. Unbelievably Elegant and Savage Design - This is an easy one. Monkeys can do this. Look at the Ferrari at the top of the page and figure out how it appears so elegant and fine boned while still having the demeanor of a bloodthirsty savage. Decipher that simple formula, update it in a respectful way, carve a many-cylindered engine block out of a single chunk of billet and, with the hammer of Buddha, pound aluminum fenders over Italian stumps that have Enzo's initials carved in the base. Eat prosciutto for lunch and truffles for dinner, bathe in cognac, drink espressos during victory laps, road test at midnight, change tires for thunderstorm wet practice, whisk baguette crumbs from the oxblood leather seats with a boar bristle brush, keep sterling flasks of courage in the glove box, smoke cigars with the commitment of Mark Twain and feed your chickens at dawn.